This friend was unfamiliar with the Church. 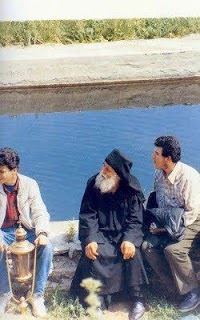 This was his first visit to Elder Paisios. He lied, saying: "No, Elder." "Look", the old man said to him affectionately, "I will hang you from that tree! You know the one!" When we arrived at Thessaloniki, at the home of my friend, that "tree" was dried up! He was stunned when he saw it. Afterwards he went to confession, and he "entered" the Church and took the path of God. Source: From the book ΓΕΡΟΝΤΑΣ ΠΑΪΣΙΟΣ Ο ΑΓΙΟΡΕΙΤΗΣ 1924 - 1994, ΜΑΡΤΥΡΙΕΣ ΠΡΟΣΚΥΝΗΤΩΝ (Elder Paisios the Athonite 1924 - 1994, Testimonies of Pilgrims) by Nikolaos Zournatzoglou. Translation by John Sanidopoulos.